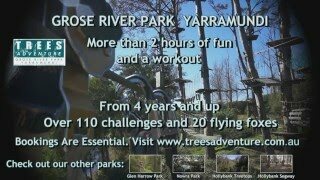 The Trees Adventure Grose River Park is one of the ultimate Treetop experiences in New South Wales. It features exciting and challenging courses that become increasingly difficult as you climb higher into the canopy, which means that you can find the right level to suit you between two metres to more than 20 metres for the thrill seekers. You will be swinging, leaping, climbing and flying through the forest, during two hours. This will suit all the family from four year olds to 75 years and over, with 10 courses, 110 challenges and 19 flying foxes - the longest more than 100 metres. Going from one tree to the next you will hear the sound of the Bell Birds, watch the Sea Eagle family soar overhead while the Kookaburras laugh whilst you have fun in the trees.